June 21, 2018 – Newsok.com – Read the original article here. The largest of four housing projects proposed to be built next to the future Omni Hotel was chosen Wednesday by the Oklahoma City Urban Renewal Authority as it proceeds with an unprecedented effort to build a public parking garage wrapped with apartments and retail. The winning team, Rose Rock Development Partners, was chosen unanimously as conditional developer for the city-owned southwest corner of E.K. Gaylord Boulevard and the Oklahoma City Boulevard. The $53 million Boulevard Place is designed at eight stories tall with 241 apartments, while the competing proposals were all five stories or less with 192 to 221 residences. The design by FSB, meanwhile, is in complimentary color scheme and pattern as the neighboring Omni Hotel while the other designs were distinctly different. Storefronts will face the boulevard with total commercial space totaling 22,000 square feet. The 261,000-square-foot tower will include a two-story, 10,700-square-foot rooftop terrace with a swimming pool, kitchen and fitness center. 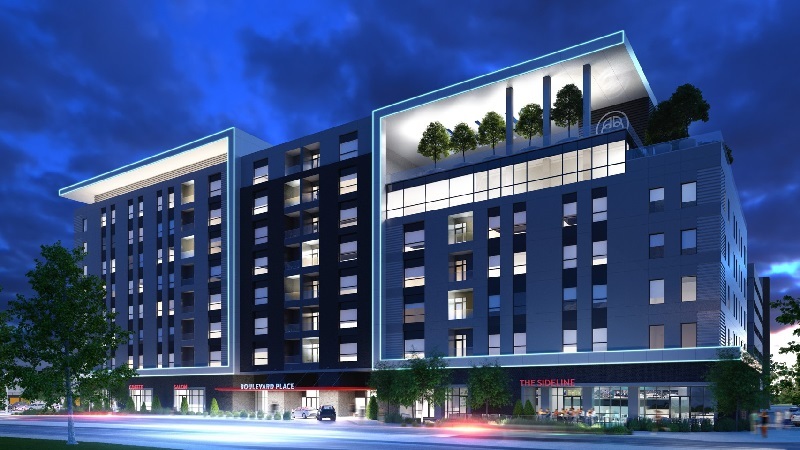 Other amenities will include multiple outdoor kitchens and an indoor tenant lounge. In response to a request by the Urban Renewal Authority, the project includes a 5,200-square-foot day care center and a 3,200-square-foot playground, both of which will have secured entrances. Bill Pierquet, senior vice president of school development for Primrose Schools, confirmed one of its local day care operators is in talks with Rose Rock to run the day care. The development design and the percentage of affordable housing units may change during negotiations authorized on Wednesday. The project currently proposes 62 studio units, 128 one-bedroom apartments, 41 two-bedroom apartments and 10 three-bedroom apartments. The request for proposals issued by the Urban Renewal Authority also asked for a mix of affordable housing. The proposal currently includes a mix of units starting at $650 a month and efficiency apartments starting at $852 a month. The percentage of affordable housing is at 30 percent and Urban Renewal Commissioner Jim Tolbert added a guidance to Urban Renewal staff that they work with the developers to increase the number of affordable apartments. The proposal currently includes the potential for seeking tax increment financing and is the only one of the four to qualify under Core to Shore downtown framework policy set by the city that requires any applicant in the area be at least seven stories high. The Boulevard Place proposal currently does not request assistance from the $10 million passed by voters as part of an economic develop bond to help develop new affordable housing.